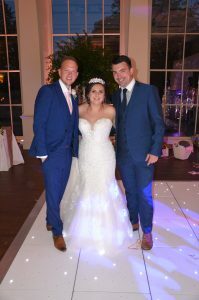 Early 2017 Sabrina contacted our team to enquire about our wedding DJ and Hosting services for her magical day at Stubton Hall. Along with the hosting and music being important to Sabrina there were also a few added touches that she thought we could help with! Sabrina and her mum Marisa met with our team around April 2017 to discuss the day so far and how we may be able to help. Choosing a host for your big day isn’t an easy task and it’s important that you meet with the host before booking to ensure that you can work together! Following the meeting we were delighted when mum Marisa called to say that daughter Sabrina would like to book with us for her wedding at Stubton Hall. Along with the wedding host and DJ service, Sabrina also decided to hire our star-lit backdrop, white LED dance floor, fairy lighting for the pergola outside and uplighting. Once Sabrina’s booking with us was secured the couple had instant access to our online system. It is here that Sabrina and husband to be Matthew could begin adding in music which was important to them, along with special dedications and adding comments for the host and DJ on the day. A couple of months ahead of the wedding I contact Sabrina with a few questions. I then arranged a convenient time for wedding host and DJ Jack to give her a call to run through things. Prepared with the questions in advance Jack and Sabrina were able to discuss the timings for the day, important songs, the speeches and other requests that Sabrina had. Following this Sabrina and I exchanged a few more emails and we were ready to go! After months (years!) of planning the big day arrived. Sabrina and Matthew’s wedding at Stubton Hall. A grand house set within acres of garden and parkland. On the morning of the wedding Jack and I loaded the van before wedding host Tom joined us. Both Jack and Tom then headed off to Stubton Hall to begin setting up. First of all up went the fairy lighting. Between the main hall and the bedrooms there is a pergola that Sabrina had asked us to decorate with fairy lights to enhance the walk way during the evening. Inside the guys then put up the star-lit backdrop, DJ equipment before installing our very sparkly white LED dance floor and uplighting. With everything in place the guys had a quick bite to eat before fully taking over with their hosting for the day. Tom and Jack worked together to get the guests seated for the wedding breakfast before introducing the bridal party into the room with a grand entrance. First up, we had Groomsman James and Paolo with Sabrina’s Nan. This was followed by the bridesmaids, maid of honour, grooms parents, brides parents all dancing along to “Kool & the Gang”. Finally the new Mr and Mrs West made their energetic entrance to “Get ready for this”! Once everyone was in and seated it was time for the speeches with wedding host Tom introducing the members of the party. Throughout the speeches we provided a wireless microphone so that we could ensure all wedding guests could hear. Following the speeches the wedding breakfast was served. It was during this time that guests also filled out the ‘Pearls of Wisdom’ cards that Tom and Jack had previously put onto the tables. Asking guests to leave advice for the newly married couple. Later in the evening wedding host Tom then read out some of the advice cards, before leaving all of them with the couple at the end of the evening! After the wedding breakfast the couple cut their wedding cake and danced together for the first time as husband and wife. Wedding DJ Jack filling the dance floor! For the evening reception Sabrina and Matthew had around 60 extra guests who had the pleasure of watching Sabrina and Matthew taking centre stage with a game of Mr and Mrs! Hosted by Tom, working with wedding DJ Jack the guys had a list of questions, sound effects and gave the couple blue and pink paddles for their answers! It would appear that Sabrina and Matthew are well suited knowing each others strengths (and weakness) … most of the time anyway!! 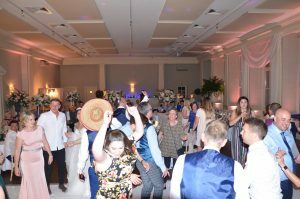 Following the fireworks at around 10pm guests then filled the dance floor throughout the rest of evening as wedding DJ Jack played a mixture of Sabrina’s requests and his own choices to work with the crowd. At the end of the night I joined Jack at Stubton Hall to help pack down. As I walked in around 12.15am wearing my Jackstar top, a lady (who I realised shortly afterwards was the mother of the bride!) thanked me for all of the work we had done and asked me to pass on my thanks to Jack and Tom as they had done ‘an amazing’ job.